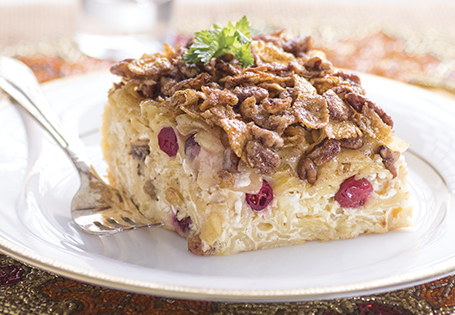 Traditional noodle casserole with a sweet cream sauce, fruit and nuts. Cook noodles for 4 minutes. Drain and set aside. In a large bowl, whisk together cottage cheese, sour cream, raisins, cranberries, ½ cup brown sugar, eggs, 1 teaspoon salt and ½ stick melted butter. Add noodles and stir to incorporate. Transfer to a greased 13x9-inch baking dish. Melt remaining butter. Combine in a medium bowl with remaining brown sugar and salt. Add corn flakes, pecans and cinnamon. Crush to desired consistency. Spread topping over noodles. Bake for 35 minutes, or until casserole is bubbling and topping is crisp.